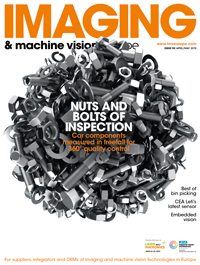 Track and trace might not have the allure of, say, robot guidance or 3D imaging and all the complexities associated with those disciplines – it is, after all, simply code reading – but it is an incredibly important market for machine vision and one that’s growing by leaps and bounds. A claim made at the EMVA business conference earlier in the year by J. Rizzo Hahn, CEO of Brazilian company Pollux Automation, was that 70 per cent of machine vision cameras sold in Brazil, with its rapidly expanding economy, were from Cognex, a brand closely associated with traceability. Cognex smart cameras are not limited to track and trace by any means – in fact one of the advantages of using vision is that it can make other inspections besides product tracking – but traceability is likely to play some role, especially in sectors like automotive and pharmaceutical which are both huge in Brazil. Brazil was the fourth largest car producer in the world in 2010, while sales of medicines reached US$22 billion in 2010 and are forecast to grow by 10 per cent a year. Direct part marking involves imprinted a mark on a part that will survive through a production process and throughout the life of the product. A classic example was Intel printing data matrix codes on the Pentium II so that it could be tracked through the manufacturing process and be used to investigate warranty claims and the like. In the pharmaceutical industry, the Food and Drug Administration (FDA) in the US has a requirement that date and lot codes are either checked twice by a human or once by an automated system for content and legibility. The Tylenol murders in Chicago in 1982, in which several people died taking pain killers laced with potassium cyanide, led to reforms in the laws governing the packaging of medicines so that they could be traced back to the manufacturer. In the last month or so, the FDA has published a proposed new rule for putting standard identifying marks using 1D or 2D codes onto medical devices, called the Unique Device Identification initiative. Beginning next year, certain classes of medical device will be required to contain standard product identification such that a hospital could scan the part, like an artificial hip for instance, and determine its source and manufacturing data. The new FDA directive says there should be both an automatic readable code and a human readable version containing the same information. The form of the automatic code hasn’t been specified, but it should conform to the GS1 format, which specifies how to encode the data; it tells the reading system which parts of the data matrix code relates to which pieces of information. Therefore, a machine vision system installed to verify medical device labels would not only need to be able to check the quality of the code to ensure it is legible, but also the grammar inside the code and the format. ‘You will also need optical character readable functionality to ensure the human readable portion of the mark corresponds to the information in the data matrix code,’ adds Ludlow. In Europe, a new directive called the Falsified Medicines directive has been proposed to enforce the printing of unique serial numbers on the primary packaging (the carton) of pharmaceuticals. The aim of the directive is to stop falsified medicines and pharma manufacturers will have until January 2016 to comply with the proposed measures. Pounder does concede that the new directive won’t have too much of a bearing on vision integrators, as the inspection setups and the tasks vision systems are required to do will be similar to what they are currently. This is namely high-speed, shop floor inspection of codes and transferring data and handshaking with control hardware on the shop floor, he says. ‘The coding equipment needs to be synchronised with the vision system, because if there are a number of products between the printer and the camera, this offset needs to be managed,’ Pounder explains. If the system rejects product, the data needs to be aggregated so that the code doesn’t become available – the rejected code has to match the product in the reject bin. ‘The worst case scenario would be that the wrong product is rejected and the faulty item remains on the line. There are a lot of operational constraints that manufacturers have to consider to make this a robust system,’ he says. ‘Vision is the agreed method of tracking pharmaceuticals,’ Pounder continues. ‘All the tracking solutions worldwide, apart from China, use 2D data matrix codes. For the speeds we’re talking about, machine vision is the only technology that people are comfortable with.’ Alain Duflot, field product marketing manager at Cognex, notes that these pharma packaging machines can run at 400 parts per minute. Cognex provides a full range of vision systems, with its In-Sight series including a software package dedicated to track and trace. Cognex also provides a dedicated user interface for pharmaceutical customers to configure the system. ‘Even if the application is relatively standard, such as reading a data matrix code, most will require some degree of customisation for the specific process,’ states Duflot. The advantage of using vision to check lot codes is that it is then relatively straightforward to add other error-proofing steps, such as reading the data matrix code on the label, the primary packaging itself and the packaging insert, to ensure all three match, says Ludlow of Microscan. In addition, the vision system can check for other aspects, such as if the safety seal is in place. Tiarks notes that traceability solutions in pharma can be quite complex from an imaging standpoint, having to deal with reflections from blister packs, for instance, which is why digital models are better suited to these applications.